Hi, This is my first brewlog, I've been too lazy to do one previously although i started one once and lost it all! lol. This is for my AG brews 17 and 18. Up to this point I have always brewed with Ashbeck , making no additions, however I have been reading about water additions for months so i took this as an opportunity for a little experiment. I brewed the same beer twice, once with ashbeck and once with tap water. Most importantly I'd like to thank rolfster for his help, this is his earl grey tea IPA with a couple of changes. One due to my stock and one due to me misreading the grain! (Sorry rolfster, I'm cross with myself for misreading a packet). Each batch had 25g of good quality Earl Grey loose tea leaves steeped in cold water overnight (I used a cafetiere) and the liquid added to the FV once at pitching temp. A single packet of US-05 was added to each. Each batch will also have a dry "hop" after fermentation of 40g of more of the same tea leaves, and 15g of a citrusy hop, probably cascade as I have quite a lot in stock. 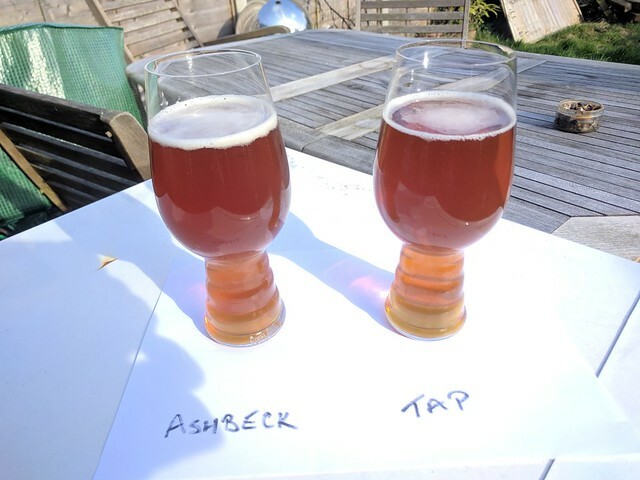 Batch 1 (AG17) is the Ashbeck version and was brewed on Wednesday. I added a tsp of gypsum to the mash and the boil having read that in a post here recently. The brew went according to plan, the sparge was exceptionally smooth and fast. I'm still playing with different ways of filtering the trub from the boiler. I decided this time to try a muslin stretched over the top of the FV which slowed that transfer down way too much and I ended up having to leave the wort mid transfer to run an errand. The wort stayed on a cold concrete floor where I brew and dropped temp too far with stalled the yeast starting activity. I didn't measure it but ambient out there was about 12c and it cant have been far off that, 15 i guess. Batch 2 (AG18) is the tap water version. I prepared the water on Wednesday night in preparation for a brew on Thursday. I have a Nutrafin KH test kit for my aquarium, which i know isn't the recommended one for brewing but its what I have to hand. This gave me an alkalinity of 160ppm but I'm not sure how accurate that is as it took a lot more CRS than calculated by jim's water calculator to add to the liquor. I ended up adding 33.7ml instead of the calculated 27.8ml to get to a point where the nutrafin kit was reading 20ppm. I also added 1.8g of gypsum to the mash to bump up the chloride sulfate ratio a bit. I'm thinking sulfuric would be a better option than CRS for me but my understanding is limited at the moment. Any advice here would be gratefully received. The sparge ran very slowly this time, I'm not sure I understand why, bottom of my grain store barrel perhaps? Im wondering if the finer material settled in the mango barrel a bit. I also had a pre-boil gravity at the same level as my target of 1.052. When transferring the FV this time a slightly modified my method which sped up the process very much. I only used the muslin for the very start of the run off, and again at the end when i had to tip the boiler and encourage the wort past the trub. I had noticed the previous day that the majority of the transfer was crystal clear. The yeast was pitched at a much more respectable 22c and roared to life within a few hours. I collected 23l of wort @ 1.060. So much for trying to tell the difference between 2 identical batches other than the water, they will end up quite different i think. LOL! Hopefully i still learn something, and if I don't ill still have plenty of rolfster's Earl Grey IPA even if they aren't quite what he intended. Sounds great! I hope you enjoy the final beer! I love doing side by side tests. It will be interesting to hear how you get on! I need to get a brew on.... not got much time in my calendar for brewing soon but my next earl grey is going to be a cascade based one as well! How is this shaping up? Hey Tim, been meaning to update this. They both took a while to attenuate the last few points and were eventually packaged last Monday after a 6 day dry hop. I bottled 5l of each batch, and 15l of each went into mini kegs. The last couple of litres I siphoned off the yeast cake into plastic bottles to force Carb. I'm still conditioning most of the batch but the car bed portions were delicious. A really vibrant hop character which is enhanced by the bergamot oil in the tea. I notice a very slight astringency at the end, which I actually really enjoy as I drink a lot of black tea. I'm really looking forward to tasting the two beers side by side which has not been possible as I only have one carbonation cap. So far I'm really impressed with this beer, I can't help but wonder how much less vibrant the flavour would be if I hadn't put the gypsum in with the ashbeck as with all my previous AG brews. Next update will hopefully have some pictures of the finished beers side by side and a comparison of the two. Great write up, looking forward to the next installment. Sounds like you've nailed it! I think the astringency will fade over time. Sorry for the delay, its been a busy few weeks and I also had to remind myself how to host pictures somewhere and hotlink them! The beers had a few weeks in the bottle, some inside and some in the shed, all stored together in the same conditions. No finings other than the kettle finings and I didn't cold crash so there is some haze. This is what they looked like after pouring. Firstly, other than my other half who has an unnatural hatred of tea, everyone who tasted this beer really enjoyed it, both varieties. I had a few willing participants one evening and thought we would have a go at one of those triangle test things that the American guys do! I didn't take it seriously enough to calculate a p value though! I was convinced that the difference in abv would be a dead give away so I was sure I would not be the only one to tell the difference. I had by this point consumed a 5l keg or two of each and I definiately knew them apart, I was so involved in watching my tasters evaluate their experiences that I actually forgot to put myself under the same test and ask someone to pour me some testers. This was my first comparison of two similar beers and I found it incredibly interesting and I hope I'll have the motivation to do some more. Thanks again goes to Rolfster for this killer recipe!